With the release of Blacula in 1972, the blaxploitation subgenre of the '70s took a welcome detour into the world of horror. For over half a century, cinema had portrayed blacks as a ragtag band of minstrels, maids, butlers or worse. With the civil rights movement of the previous decade well in play, by the early 1970s - there was no denying the fact that black actors and actresses relished the opportunity to showcase their talents in a more individualized - if no less energetic - light. Racial stereotypes often abounded (drugs, criminal behavior, violence, etc.) but black audiences…not to mention a good number of whites…ate it up. Performers such as Pam Grier (Coffy, Foxy Brown et al), Fred Williamson (Hell Up in Harlem), and Richard Roundtree (Shaft), all of whom might have otherwise been reduced to the sidelines in mainstream movies, became recognized stars in their own right. Blacula was the most successful - and is the best-remembered foray into the horror subgenre. Shakespearean-trained actor William Marshall, with his booming voice and charisma, was cast as the lead, and William Crain directed. Transylvania, 1780. Count Dracula (Charles Macaulay) has invited African Prince Mamuwalde (William Marshll) and his wife Luva (Vonetta McGee) to his castle. “I’ve never before had the opportunity of entertaining personages from the Dark Continent,” he tells them with some condescension. Mamuwalde’s objective is simple. He is there to try and get “civilized” European countries to give up the slave trade. After dinner, the host and his guests settle down for drinks. Mamuwalde and Luva have had enough but they are prevented from leaving by Count Dracula’s followers. The Count, now bearing fangs…bites Mamuwalde in the neck and together with several female vampires, brings the prisoners down to his cellar. As the Prince lays in a coffin with Luva watching, Count Dracula speaks: “You shall pay, black prince. I shall place a curse of suffering on you that will doom you to a living hell. I curse you with my name. You shall be…Blacula!" Luva’s fate is no better. She is entombed in the cellar for all eternity with her husband, never to see the light of day again. Transylvania, in the present. Two American gay antique dealers, Bobby McCoy (Ted Harris) and Billy Schaffer (Rick Metzler), have made their way to the castle for business purposes. Told by the real estate agent (Eric Brotherson) that the place once belonged to Count Dracula, the men are disbelieving. What excites the men most are the treasures found in a hidden room below the castle, including the padlocked coffin in which Mamuwalde had been encased. The couple brings their acquisitions back to America and as they are about to start tagging, Bobby breaks open the padlock. Billy cuts himself and the scent of blood makes Mamuwalde rise out of the coffin. His great strength easily subdues the men and after biting the both of them, the prince settles down for the time being. At the funeral parlor, Bobby’s body lies in an open coffin. Mamuwalde/Blacula watches as friends of the family pay their respects. Among them are the Williams sisters, Tina (Vonetta McGee again) and Michelle (Denise Nicholas). They are joined by Michelle’s boyfriend and co-worker, Dr. Gordon Thomas (Thalmus Rasulala). Mamuwalde notices Tina’s amazing resemblance to his beloved wife Luva. Meanwhile, Gordon…member of the government’s Scientific Investigation Division…has a conversation with Swenson the Undertaker (Lance Taylor, Sr.). It seems Bobby may have died under unusual circumstances. His neck wound shows that flesh was torn out in a big chunk and his coloring indicates a heavy loss of blood. A rat bite this wasn’t. As she walks home, Tina feels as if she’s being followed. She bumps into Mamuwalde, who scares her by referring to her as Luva. Tina dashes off to her apartment but drops her purse that contains her I.D. and keys. She enters her home using a spare set and when Michelle arrives later, she finds her sister in a panic. Blacula is hit by a taxi...and unable to catch up to Tina, he finds a consolation: the blood of a sassy cab driver named Juanita Jones (Ketty Lester). The next day, Gordon goes to the morgue to examine Juanita’s body. Sam the Mortician (Elisha Cook) brings her out and Gordon is able to see that the corpse shows damage similar to that of Bobby McCoy’s. He orders autopsies on both victims and phones Swenson to inform him that Bobby’s body will be picked up that evening. In a conversation with Lt. Jack Peters (Gordon Pinsent), Gordon expresses his frustration with the police department’s lack of urgency concerning the investigation and scoffs at the lieutenant’s suggestion that the Black Panthers (!) might be behind the murders. That group would hardly target two gay antique dealers and a female cabbie. For Michelle’s birthday, Tina and Gordon take her out to a nightclub. Mamuwalde is there and after returning Tina’s purse and apologizing for unsettling her, he is asked to join them at their table. A friend named Skillet (Jitu Cumbaka) arrives as well. Gordon receives a phone call from Swenson at the club and is told that Bobby’s corpse is missing from the coffin. No body, no autopsy. Mamuwalde decides to make an exit in a hurry after Nancy (Emily Yancy), a photographer, takes his picture. Tina, who is drawn to his magnetism, promises to meet him back at the club the next night. Nancy wants to develop the photos immediately and walks over to her house to use her darkroom. Blacula follows her and just as she discovers that he’s nowhere to be seen in the pictures (“where’s that big dude with the cape?”) – he lunges forward and bites her. A cop finds her stumbling outside on her porch and when he tries to help, she turns on him. Gordon cannot get permission to exhume the body of Bobby’s partner Billy in order to perform an autopsy - so he takes matters into his own hands. He and Michelle (who have been collecting books on the occult) go to the cemetery and dig him up themselves. Billy suddenly leaps up out of the coffin and attacks them but is killed (for the final time) by Gordon, who impales him in the chest. Gordon realizes he still has yet another lead with the lady cabbie. He phones Sam and tells him to take Juanita out of deep freeze so her body will be warm. Sam does as he says...but when Juanita thaws out, she gets up and runs down the morgue’s hall and towards the terrified mortician. Gordon drops Michelle off at Lt. Peters’ home and both he and Peters drive out together to the morgue. Lt. Peters sees firsthand what is going on when Juanita suddenly sits up on the gurney and attacks them. Gordon pulls out a cross and opens the blinds…and the light comes in and kills her. Mamuwalde makes love to Tina and describes the fate that befell he and Luva. In addition, he tells her he believes she is the reincarnation of his dead wife. He promises her a painless eternal life if she leaves with him – and it is something Tina finds appealing. Gordon discovers a negative at Nancy’s house and realizing that Mamuwalde is the vampire who is being sought, he goes to Tina’s apartment to confront him. Mamuwalde is able to get away and kills a police officer in the process. Bobby is spotted and followed to the warehouse where Blacula’s servants are holed up. Gordon and Lt. Peters are besieged by this army of the undead...but they are able to escape by setting the vampires on fire. Blacula appears and taunts them before turning to a bat and flying off. Tina reluctantly agrees to try and entrap her lover. But Mamuwalde uses telepathy to lure her to his hideout in an underground chemical plant. The police are on her tail and when Tina is accidentally shot, Blacula bites her and attempts to keep her alive. Gordon and the lieutenant find his coffin and open it with the intention of driving a wooden stake through his heart. Instead, they plunge the stake into Tina. When Mamuwalde realizes he will never have his love, he walks out into the daylight and disintegrates to the bone. Blacula is no more…or is he? Blacula is slick and well acted. But the majority of its success can be attributed directly to William Marshall’s commanding lead performance. His portrayal manages to be both frightening and sympathetic, quite a feat for a performer to achieve in this type of role. The movie was the recipient of the first Saturn Award for Best Horror Film, an honor given each year by the Academy of Science Fiction, Fantasy and Horror Films. There IS an unfortunate strain of homophobia in Blacula. Clearly aiming for an easy laugh, ugliness rears its stereotypical head when the two antique dealers are depicted as fey, quibbling clowns. Adding insult to injury, some of the dialogue spoken in reference to these gay characters is unnecessary and cheap. 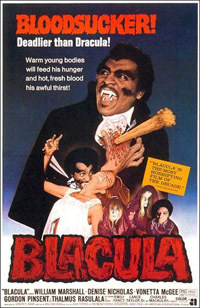 Ultimately, this reveals a core weakness about Blacula; it's a film struggling to portray one minority group in a good light, yet at the same time coming off hateful and derogatory towards another. The fine, funky, badass original score was provided by Gene Page but the real treat is watching the Hues Corporation play a highly energetic in-house group in the nightclub scenes. Two years later, they were number one on the Billboard charts with the classic disco hit Rock the Boat, one of the great pop songs of the era. John M. Stevens was responsible for the cinematography and he would go on to show his skills in the desert thriller Dying Room Only. Director William Crain worked very little after his success with Blacula, but did return to the genre with Dr. Black, Mr. Hyde in 1976. William Marshall memorably appeared on the original Star Trek as Dr. Richard Daystrom. The actor returned to the role of Mamuwalde in the inevitable sequel, 1973’s Scream, Blacula, Scream...and in Abby (1974), he was a clergyman/exorcist battling evil. He died on June 11, 2003 of complications from Alzheimer’s disease. Blacula is also graced by the beauty and talents of two young actresses: Vonetta McGee and Denise Nicholas. McGee would co-star in the film The Norliss Tapes the following year and she continued to work mostly in television, including reoccurring roles on Cagney & Lacey and L.A. Law. Likewise, Nicholas has worked steadily throughout her career and among her credits are the excellent Five Desperate Women (1971) and the series Room 222. Actor Thalmus Rasulala was no stranger to ‘70s audiences and was featured on Sanford and Son, Good Times, The Jeffersons, and as Roger and Dee’s father on What’s Happening!!. Indeed, he made his mark on every major African-American sitcom of the decade while also managing to appear in important works such as The Autobiography of Miss Jane Pittman. Rasulala passed away in Albuquerque, New Mexico, on October 9, 1991 of a heart attack. Sequel aside, Blacula lead to a spate of derivate horror films with largely black casts including Blackenstein, The House on Skull Mountain, Sugar Hill and the aforementioned Abby and Dr. Black, Mr. Hyde.